The Funky Felter: Yay! 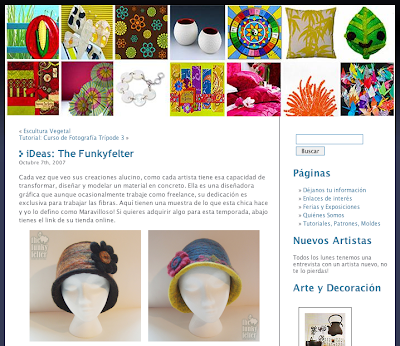 I've been featured on Handmadecrafts, an artsy crafty spanish language blog! Yay! I've been featured on Handmadecrafts, an artsy crafty spanish language blog! "Whenever I see its creations I hallucinate, as each artist has that capacity to transform, to design and to model a material in concrete. She is a graphical designer who although occasionally works like freelance, her dedication is exclusive to work fibers. Here they have a sample of which this girl does and I define it as Wonderful! If you want to acquire something for this season, down you have the Link of its store online." Okay, so its probably a little off in the literal meaning, but you get the gist of it all - very kind words about my woolly creations. You can read the entire article here, or if you're not a spanish speaker, you can just look at the lovely photos on the blog as I did. It is very interesting and makes me wish that I were bilingual! I just had to share! It is very exciting when I see my items reach an entirely new culture. It makes me think "what a small world after all" and how we, as humans, are very similar at the core of our being.